According to the recent report by UN Women, “the 2030 Agenda for Sustainable Development promises to put an end to barriers that prevent women and girls from realizing their full potential”. But significant challenges still lie ahead ­- while more countries have taken action to track budget allocations for gender equality, women and girls are still over-represented among the poor; are more likely to be food insecure and have lower incomes; discrimination and violence against women and girls are still prevalent; and, every year, 15 million girls under the age of 18 are still forced into marriage. Here at Young Lives, we recognise the Sustainable Development Goal commitment to achieving gender parity and empowering women and girls. By following the same children from birth to adolescence and then on to adulthood, we provide evidence of trends and challenges girls encounter over their lives. Below are some of the obstacles to gender parity as evidenced by our recently released gender visualisations. 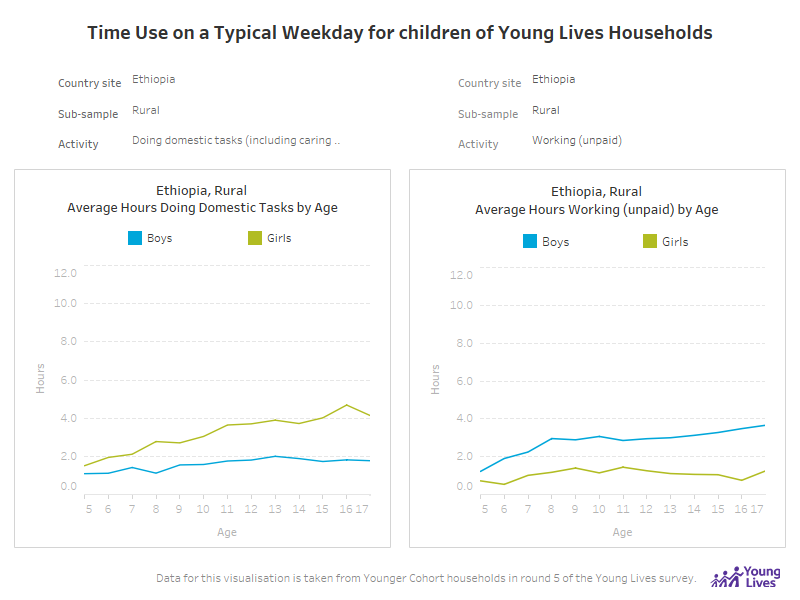 Please note that while the visuals below are static, the interactive data visualizations are available on the Young Lives website. According to the Young Lives summative report on children's work, work can be beneficial for children’s’ development and wellbeing by enabling children to earn to pay for school and through the development of essential life and social skills outside of school. However, too much time spent caring for younger siblings and doing domestic tasks could erode into time for schoolwork, which could then negatively affect a child’s development. To reduce the pressure associated with household work and relieve this burden (which is experienced mostly by girls), households’ access to childcare should be improved. While school enrolment rates are rising and information on reproductive health is becoming more widely available, many girls are still entering into marriages and having children at a young age. A significantly higher number of girls marry by the age of 18 in all Young Lives countries, whereas boys marry later. India is the most striking example, with one in three girls marrying by the age of 18, and half marrying by the age of 20 (with only 7% of boys married by that age). Girls who leave school early were more likely to experience such early marriage, while those coming from the poorest households were twice as likely to be married by the age of 18. 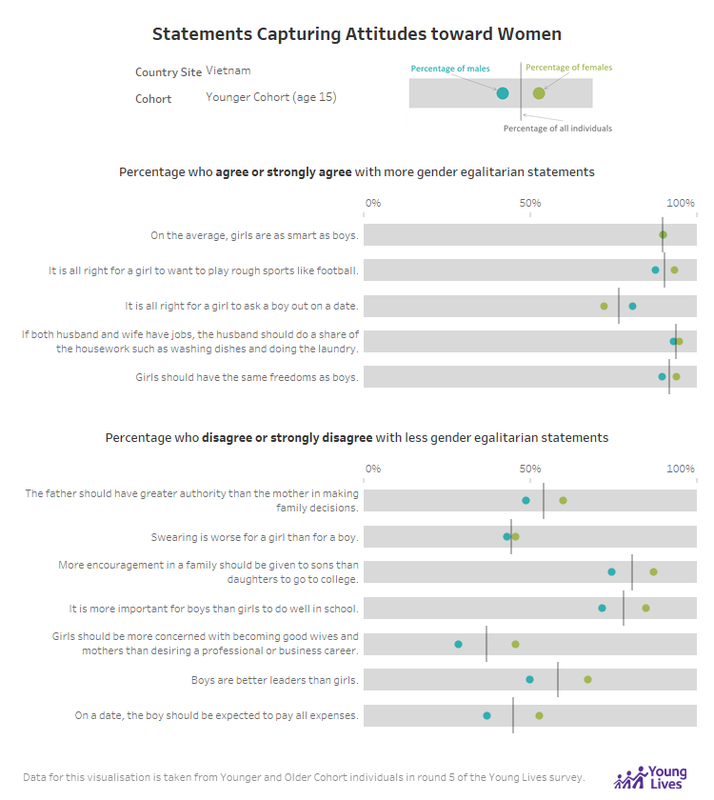 Parents’ educational aspirations for their children also matter in determining whether or not a girl marries early. Poverty and social disadvantage constrain girls' opportunities and exacerbate the risks they face, forcing individuals and families to maintain 'normal' practices, thus reinforcing norms. 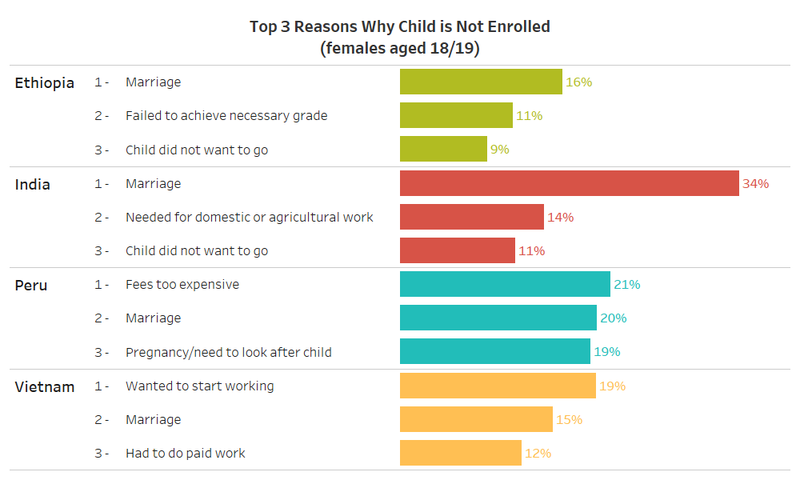 In India and Ethiopia, marriage was cited as the most common reason for girls leaving school by age 18/19, whereas it was one of the top three reasons identified across our sample in Vietnam and Peru. In fact, many girls who are married or cohabiting at this age tend to stay at home. Half of married or cohabiting girls in Ethiopia, India, and Peru are neither working nor studying at age 18/19. Marriage is a turning point for these children, with few returning to school after marriage. It is not only practically difficult to combine marriage with schooling, but these girls are expected to focus on domestic duties and to have a child soon after they wed. Young, married women rarely have a role in decision-making over how money is spent. Within their marriage and often remained dependent on their husbands. Early marriage also exposes girls to violence and emotional, physical, and sexual abuse since they have fewer skills and less negotiating power. Consequently, girls’ ambitions and their sense of self-empowerment can weaken. Adolescence is an interesting developmental phase with respect to gender-role issues; and studies have shown that there is a heightened awareness of gender differentiation during adolescence. 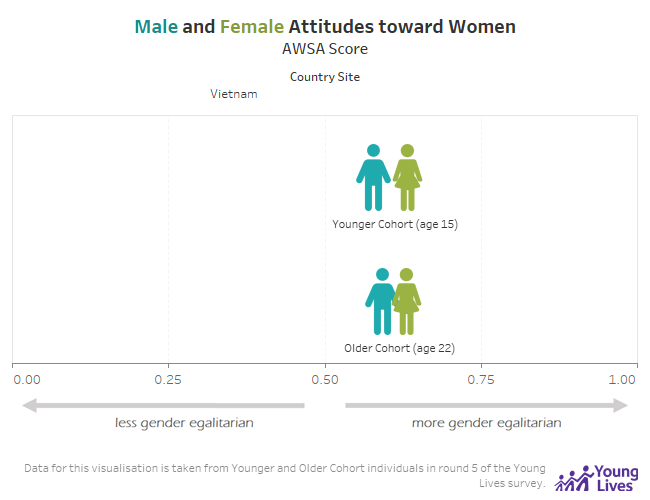 In all Young Lives countries, boys hold less gender egalitarian views of women’s rights and roles than girls do when they are 15 years old, but both boys’ and girls’ views become more egalitarian when they are 22 years old, but a gender gap remains.